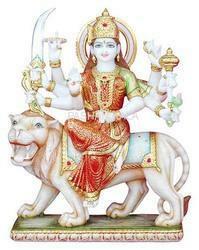 We are reckoned manufacturer and exporter of Marble Durga Maa Goddess Statue. Some of the notable attributes of these vertical limit falls are its unique view, fabrication from best grade material, everlasting finish and attractive shapes and colors. Durga is the most splendid personalization of devi, she is an invincible power of nature and contained within her the power of all the gods. These Durga Maa are carved out of quality marble stone and meet the customized demands of clients. Utilization Home decoration, Kitchen, Floor, Bathroom, Hotel, Bungalows etc. To take a bath into the shower of grace & blessing which is bestowed by loving gods, you can avail beautiful Marble Durga Maa Statue that are offered by us. 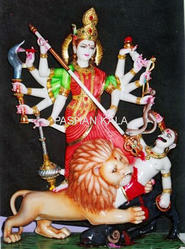 Durga Mata Statue offered by us are demanded across global market. For making these Durga we make sure that a realistic look can be given to them. These statues offer excellent shine and brilliance. 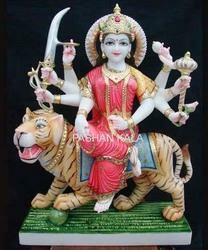 We offer Marble Durga Mata Idol in various other forms also and at reasonable price..
We are engaged in providing Marble Durga Maa Statue and Durga Mata Statue to our esteemed client. These are made of white marble and available in different specifications as per client’s request. Our white Marble Durga is available in different specification as per the request of our clients. We do not make any compromise in terms of quality and so we use high grade raw material for the manufacturing of these statue. We are manufacture of a comprehensive assortment of Ambe Maa Statue that are designed by experienced sculpturer and craftsmen. All team member work in close coordination so as to develop and deliver flawless range. The Maa Durga Marble Statue availed from us depict the goddess of knowledge in full glory. This Durga Mata is made of premium quality. 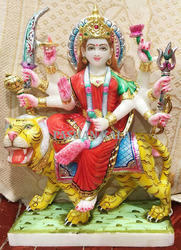 Our organization specializes in providing a wide range of Marble Kali Maa Statue to our clients, which is ideal to gift as well as decorate one's home. These Maa Kali are crafted using beautiful stones, which are sourced from certified vendors in the market. Our quality expert also make sure that our range is designed with extra care and it is free from any kind of defect. The statues of Durga Mata offered by us with an epitome of delightedness and fine artistry. White Marble Durga Maa Statue is the most splendid personalization of devi, she is an invincible power of nature and contained within her the power of all the god. Available in various design, size and color, these are carved out of quality stone and meet the customized demand of client. Splendid and charming piece of Marble Durga Statue. • We can make sizes : 4, 6, 8, 10, 12" inches. • Best Quality and customize requirement acceptable. Quarried from some of the renowned vendors of the market, the marbles used for designing attractive Maa Durga Statue have excellent shine & brilliance. The pure white marble stone are painted using soft combination of pastels color. Owing to their artistic appearance, the Marble Durga Statue are demanded by clients across the globe and we provide at competitive prices. 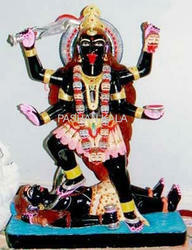 We offer our client a life like Black Marble Kali Mata Deity. Who is worshiped in the hindu religion as the hyper form of Goddess Durga Statue. 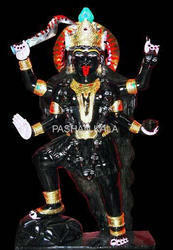 The Marble Kali Mata we offer is carved out using premium quality black marble and has a superior polish. These are used as décor piece in domestic sectors. We provide these Kali Maa in several color combination and size of suit the varied choice of our client. 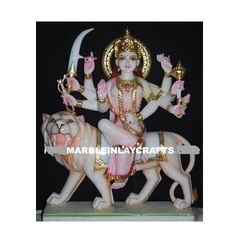 We offer our clients a splendid collection of Marble Durga Mata Statues that is manufactured using premium quality material which is sourced from certified vendor. Well known for excellent finishing work, our Durga Mata are attractive as well. Moreover, these can also being used as gift item as well as for worshiping in temple at home. Our Sherawali Maa Marble Statues are beautifully coloured and have high aesthetic appeal. 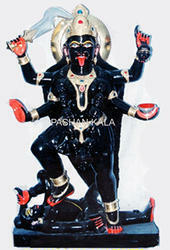 We offer ten hands Black Marble Maa Kali Statue to our esteemed client. These are exquisitely designed and crafted using excellent quality marble. In order to meet demand and expectations of our esteemed clients. Our Marble Kali are available in attractive designs and style. Maa Kali has been beautifully handcrafted by our artisans, an ideal piece to adorn your house. We are offering exclusive range of Marble Ambe Maa Statues.These Durga Maa are fabricated by high grade quality raw material and marble. We offering these as per clients requirement and ensure that these meet the expectation of our customers. If you are looking for a company which has set benchmark in the manufacture and export of Marble Durga Idols, then our organization is the best choice. These Durga Maa Murti are highly praised by our clients for their long lasting shine and fine finish. • For workship, decorative and gifts• Worldwide shipping. 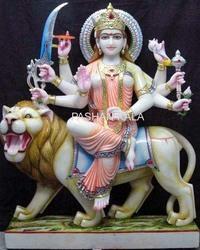 We are offering a wide assortment of brilliantly radiant Marble Durga Goddess Statue. Durga offered by us is the result of passionate zeal and hard-work with which our sculptors works. Every detail like facial expression, gesture, shape etc. has been beautiful covered so that realistic look can be given to these Marble Maa Durga. In various size Durga Mata is available. We offer the Maa Durga at competitive price. • We can make sizes : 12, 15, 18, 21, 24, 27, 30, 33, 36, 39, 42, 45, 48, 51, 54, 57, 60, 63, 66" inchMarble Durga Goddess Statuees etc. Avail from us an exquisite collection of Marble Kali Mata Statues designed under the supervision of a skilled team of designer. Maa Kali Marble Statue manufactured by us is perfect for interior décoration for it adds a stroke of style to the interior. 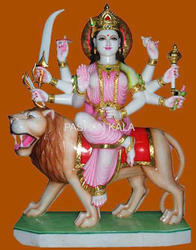 The exceptional design of Marble Kali Mata is widely applauded by the international client.. Backed by the team of highly skilled and trained artisan, We are manufacturing a splendid collection of statue of Marble Durga. Manufactured by utilizing the finest quality material stone, Our offered Marble Bengali Durga have feature of excellent finish, attractive look and smooth texture and edge. Our artisan use tradition and contemporary method to represent their creativity. 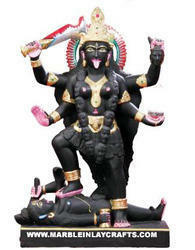 Clients can avail this Bengali Maa Statue in different color combination and size at industry leading price. • We can make sizes : 24, 27, 30, 33, 36, 39, 42, 45, 48, 51, 54, 57, 60, 63, 66" inches etc. We have emerged as a leading business enterprise in the field of making beautiful sculptures. 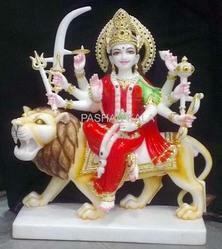 We are offering Durga Mata Statue which is highly attractive and limpid. Our prudent craftsmen apply their experience and knowledge to make these beautiful Maa Durga. Subtle pastel color that are sourced from trusted vendor are used to further adorn marble statue. We offer customization facility also. 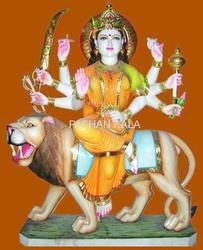 At reasonable prices Durga Statue can be availed. 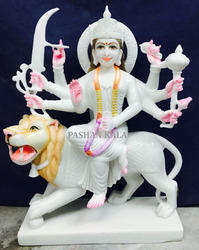 The Durga Maa Statue which we offer are made from white marble. The deity is draped in pink color which appeals to the wide range of customer. The goddess riding on lion present and image of lady with power. 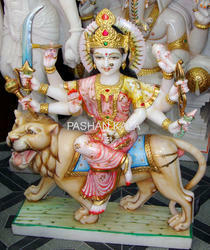 These Marble Durga Mata are carved by multi skilled artisan who give these Maa Durga proper finish and glossy image. Our product are available in the market at leading rate. 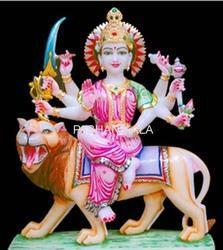 We have in store for our clients Durga Maa Statue Colorful. These are intricately designed on pure white marble. We use hand tool to give detailed attention to facial expressions. Offered at industry leading rate, the Marble Durga are reckoned for their brilliance and shining appearance. Clients can avail this Durga Maa Statue in different color combinations and size at industry leading prices. We are engaged in offering Maa Durga carved in our white marble stone. The structure possesses beautiful shine and exuberant radiance. Our creative craftsmen use skillful combination of pastels color. We ensure that the consignments reach the specified destination with stipulated time frame. 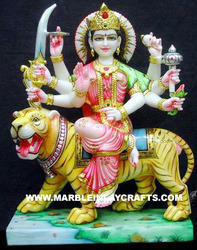 Our clients can avail the Marble Durga Mata Statue at affordable price rate. 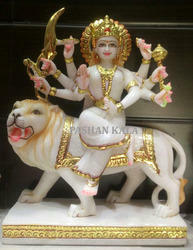 Looking for Marble Durga Maa Statue ?